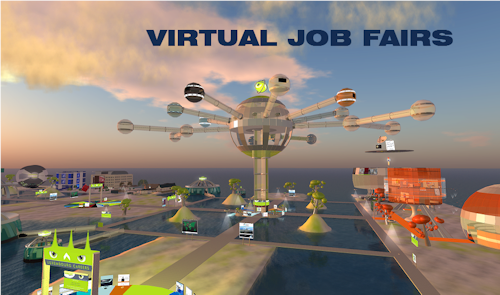 While virtual job hunting in 3-D worlds may be considered an emerging trend, virtual job fairs hosted on Web sites are happening on a regular basis. Recently Building, a U.K.-based publication, sponsored Building Virtual Careers 2008—a two-day event held completely through a Web site. The event targeted consultants, contractors, and house builders; registration was free through the magazine’s Web site and participation open to anyone across the world with an Internet connection. The site was organized into three main areas: an auditorium where visitors could attend seminars, a lounge that offered networking opportunities, and the convention center where each prospective employer hosted a virtual space. Those interested in a particular company could “enter” into an area by clicking on the company’s virtual booth, and then chat with company representatives. Over the last year, job fairs have also started showing up in virtual worlds such as Second Life. Last November, Gax Technologies hosted a virtual job fair that brought together more than 1500 job-seekers from 45 countries and 20 prestigious head-hunting and recruiting firms. The Luxembourg-based IT company set up the Working Worlds job fair in the 3-D virtual world of Second Life (SL) to help attract qualified personnel to available jobs in the financial and services sectors in Luxembourg. Throughout a 13-hour period, candidates were able to visit company booths, meet with recruiters, and attend presentations, all in the virtual world of Second Life. With 30% of the registrants from France, 11% from the U.K., 9% from Poland, and 8% from Belgium, the virtual setting facilitated the ability for those attending to participate in interviews. "This new form of virtual recruitment gives international professionals unparalleled access to Luxembourg, which has some of Europe's highest wage levels and favorable taxation rates, combined with a growing need to add to its skilled workforce,” said Cornelia den Hartog, managing director of GAX Technologies. The success of this first job fair, which resulted in 300 interviews and the filling of at least 50 positions, convinced Gax Technologies to host another event, the Benelux Career Fair, in May of this year. This event showcased the largest employers located in Belgium, the Netherlands, and the Grand Duchy of Luxembourg. Presence Package: a billboard presence on the Working Worlds islands with a link to the company’s Web site. Participating Package: a stand in the “Business Center” with furniture and publicity space for the company’s use for a period of one year. Sponsor Package: a new, customized building is placed on the island for the company’s use for a period of one year. Because the Working Worlds virtual site is available 24/7, 365 days a year, company representatives and job seekers can check out the event area anytime by signing up for a free Second Life account, downloading and launching the Second Life software, and teleporting to the Working Worlds extensive and colorful, four-sim area. Several companies, including Kaupthing Bank and Lombard, have already established a virtual setting on the sims. Gax Technologies also has an office there, along with a set of buildings offering job postings in specific industries such as IT and finance. Like private business, government agencies have experienced the same challenges of finding qualified candidates. And over the last year, two agencies in particular have taken advantage of the 3-D interface of Second Life to offer job-related information with the intent of attracting job candidates. Missouri State has been involved in Second Life for over a year and has hosted at least two job fairs, the last being held in June of this year. 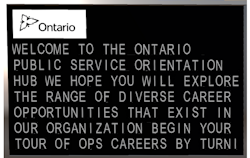 Ontario Public Service recently launched their own island, OPS Careers, in Second Life to introduce their workplace and available job openings to potential job candidates. Those teleporting to the island will arrive in the OPS Welcome Center—an area with displays about various positions available throughout the organization. Those wanting more in-depth knowledge can travel around the island to regions set up with job-specific displays. Health sector jobs are represented with a building that houses rooms for interviewing and a room that illustrates the CPR method. A fire-fighting display is set up outside between the health building and the welcome center, and a traffic media building is located in the southwest corner of the sim. Visitors to this area can watch a simulation of video screens that monitor traffic conditions throughout Ontario. The center of the island hosts an airport runway and hangar. The water testing lab, located in the northeast corner of the island, has an activity that can be completed to give those interested a better idea of the type of work involved in this sector. Avatars wear a “Water Sample HUD” that attaches a water bottle to their hand. Then the visitor must leave the lab, collect a sample in a nearby body of water, and then bring the sample back to the lab and test the sample by clicking on the water testing machine. Results of the sample are then reported. Finally, back in the welcome center, visitors can access kiosks for specific job information in 18 categories, pick up some free gifts, and watch job-related videos.